Did you find any amazing treasure while out and about this weekend? Dan and I went to a local sale that is held once a year. They sell mostly childrens clothing but they have a lot of this and that as well. Last year we found Dan's office chair and picked it up for a steal. 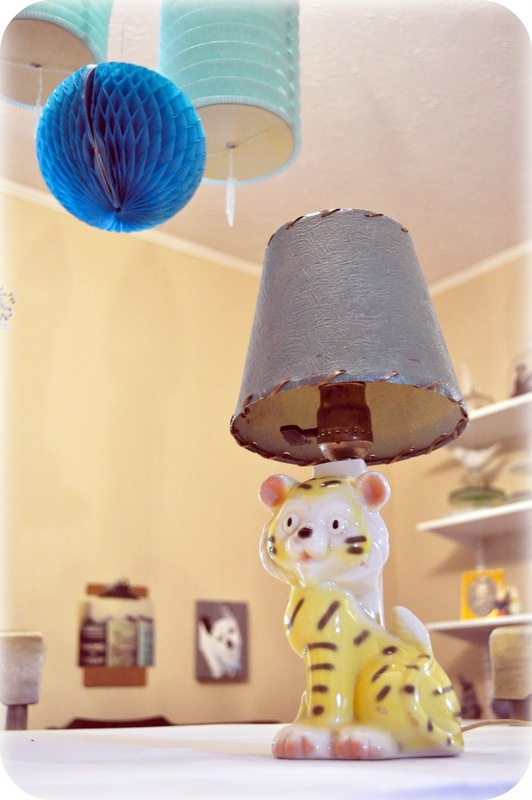 Anyhow, we found this adorable vintage lamp (in working contition) and the pink lampshade. I figured I could recover the lampshade. When I came home I had our new lamp try on a few different shades for size. Which lamp shade do you like best for Baby Coco's little lamp? Don't worry about the color just the sizing. p.s. Check out more fabulous treasure over at Her Library Adventures and Apron Thrift Girl. ooh what an adorable lamp! love it!! I liket he small blue shade the best~! So cute! I love the little blue shade. It goes really well with the style of the lamp! i vote for the small blue shade style as well. that lamp is freaking adorable. I like #2 - I don't like it when I can see the hardware on the lamps like in #3. #1 covers his cute little ears. That lamp is just sweet. Definitely the blue shade, so cute! I think the middle one works best with the height of the animal. ooo so cute! I've started looking for a lamp for Baby Woo's room too! I love your little tiger! My dream lamp would be an owl. I like the size/style of the blue shade best, but maybe it should be a little bit longer? The blue size for sure! Cutecute! I like the size of the blue shade.